Verdict: A delightful array of prints. ​Through March 31. $50 -$45,000. 11 a.m.-6 p.m. Tuesdays-Saturdays. Vinson Gallery, 119 East Court Square, Suite 100, Decatur. 404-370-1720, www.vinsongallery.com. It is fitting that British printmakers Chris Pig works in black and white: The world he creates in his recent prints evokes film noir. 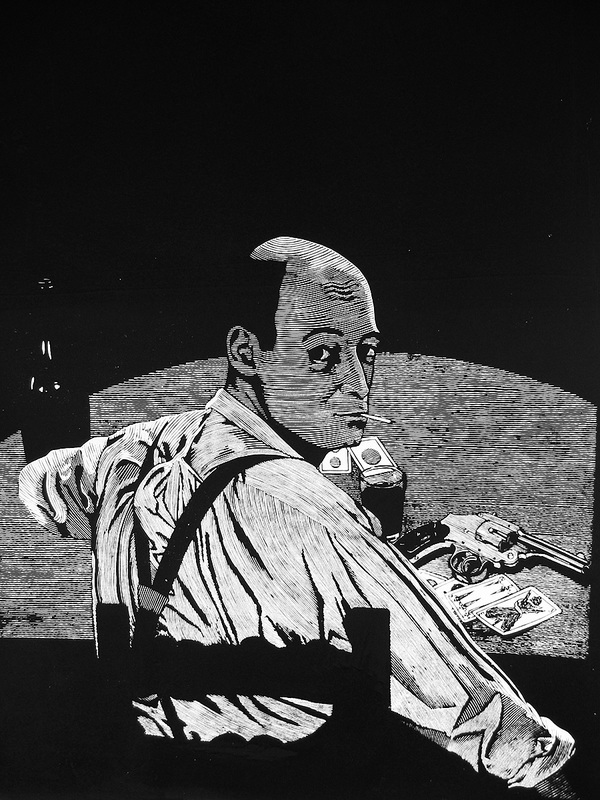 The linocuts at Vinson Gallery feature characters like the brazen gypsy who stares down the viewer in "The Whore of Destiny" and the shadowy guy who keeps his cards and his gun on the table in "Who Killed Sugar Baby?" The old soul in the romantic "Papuna" seems to be hiding a mysterious back story behind his careworn expression. There's even something slightly menacing about Pig's print of an artichoke. Pig is a master of stagecraft. "Sugar Baby" pays homage to a murdered British anarchist, but the other characters are his fiction. The gypsy is a friend playing dress-up, and "Papuna" is a Russian-born musical instrument salesman in Decatur, whom Pig befriended at a bar. He accentuates the drama through lighting and set design. In "Sugar Baby," for example, he reduces the composition to simple shapes, largely circles and ovals. A single, searing ceiling light illuminates the man and the table. "The Whore of Destiny" is a bravura orchestration of patterns. The crisp lines, bottomless black planes and complex details in these prints demonstrate his technical command. His play with figure/ground recalls M.C. Escher, whose prints are also on view in this group show, but is also related to the Moorish decorative elements he fell in love with while living in Cordoba, Spain. Fernando Feijoo displays a similar interest in people at the margins of society, but he takes a different tack. Positioning himself as a modern-day William Hogarth, who satirized English mores in the 18th century, Feijoo heads over to the seamy side of town, where drunks lie in the street, prostitutes solicit customers, jailbirds lean out of the prison bus and general mayhem prevails. Craft takes a back seat to style in his work, which is high-spirited, rough and cartoony, a la Red Grooms. Anne Desmet is his polar opposite. She works small, sometimes producing images only 2 inches square. She is more interested in places than people, particularly architecture, which she renders meticulously but often subjects to aesthetic manipulation, as demonstrated in "Panorama," a sweeping but fragmented view of Italian rooftops. The control required to produce her level of detail on such a small scale renders her command of her craft all the more impressive. Photographers remind us that the ordinary is the weirdest stuff of all. You can't swing a cat at this year's month-long, citywide Atlanta Celebrates Photography shutterbug-o-rama and not hit some view of the Hyperbolic Ordinary. This year's ACP is, as always, jaw-dropping in its diversity, and a number of the event's featured photographers view the ordinary through a conceptual keyhole. They examine their hometown back yards (Angela West); the jiggling thighs and capacious backsides of overweight Americans (Lesley Ann Price); the charismatic, country fried redneck (Judy Kuniansky); the girder-straddling construction worker (Marcia Blake); and a brand of humble Southern culture with a tang of the familiar (Mark Starnes, Dana Kemp). "I do think that this kind of personal perspective is 'hot' in photography right now," says ACP co-founder Corinne Adams, who points to seminal figures like photographer Nan Goldin, who has made a career out of snapping intimate, fly-on-the-wall photographs of her darkly glamorous coterie of Manhattan night crawlers. "It does seem that Goldin's work has given more permission or impetus to other photographers to see and document what is in their faces or in their own back yards," says Adams. The quotidian-transformed-into-art looms large in this year's ACP, as exemplified by the darkly romantic view of the South seen in Mark Starnes' exhibition Good Country People ... Images of the Rural South at The White Space Gallery in Inman Park. Inspired by his hometown of Williston, S.C., the SCAD-educated photographer has devoted his life's work to capturing the distinctive allure of Dixie. Starnes often shoots on a plastic Chinese-made Holga camera — a quirky favorite tool of amateur and professionals alike. Images shot on the Holga will also be featured in a show at Decatur's Vinson Gallery dedicated to work done on toy cameras by Marvin Rhodes and Shawn Vinson. Starnes employs the Holga's distinctive light leaks and drop-off around the frame edge to enhance his photographs' atmospherically old-fashioned qualities. It seems not coincidental that Starnes has considered careers in both taxidermy and the mortuary arts. His images are coated in a layer of symbolic dust, mementoes of dying times and long, departed things associated with rural Southern life. Starnes creates mood-drenched pictures of Guinea hens, a precociously seductive young couple at a Williston junior prom, a dead deer by the roadside, Civil War re-enactors, rattlesnake roundups and country church baptisms that are extraordinary despite their simple subject matter. The images remind us of how photography captures what has passed and echoes the fragile mortality of our own lives. Answering Starnes' brooding romanticism with clear-eyed realism, Marcia Blake takes color photographs of the ubiquitous but often overlooked construction workers who are a fixture on the urban scene. The images are featured in Hard Hats, one of the small, stealthy shows that creep into all manner of Atlanta businesses during ACP, from coffee shops to churches, hair salons and hospitals — even a car wash. Housed in a back room of Jake's Ice Creams and Sorbets on Piedmont Avenue, Blake's admittedly flirtatious images celebrate a certain rugged masculinity symbolized by close-ups of these sun-baked working men. Blake is frank about the source for the work — a sixtysomething female photographer's desire to turn the tables on men and an effort to celebrate the pulchritudinous bounty of the male animal. "[I] don't want to sound banal and talk about the 'inner beauty and nobleness of the working man,'" says Blake, "but that was part of my impetus." Men surveyed by women may soon have their day, but for now teenage girls are still the hottest property in conceptual photography. Lauren Greenfield, who created a gripping survey of teenage girls in her book Girl Culture, will treat that ubiquitous-but-mysterious phenomenon during an ACP lecture and book signing. ORDINARY COUNTRY PEOPLE Works by Mark Starnes. Oct. 10-Nov. 2. The White Space Gallery, 814 Edgewood Ave. Thurs.-Sun. 11 a.m.-5 p.m. 404-688-1892. HARD HATS Works by Marcia Blake. Through Oct. 31. Jake's Ice Creams & Sorbets/Midtown, 970 Piedmont Ave. Sun.-Thurs. 11 a.m.-11 p.m., Fri.-Sat. 11 a.m.-midnight. 404-685-3101. TEN: A TEN-YEAR PERSPECTIVE Works by members of Women in Focus, including Judy Kuniansky, Lesley Ann Price and Dana Kemp. Oct. 10-Nov. 8. The Seen Gallery, 321 W. Hill St., Suite 7A, Decatur. Tues.-Fri. 11:30 a.m.-2 p.m. and 5-9 p.m.; Sat.-Sun. noon-5 p.m. 404-377-0733. PHOTOGRAPHY UNPLUGGED: PICTURES MADE WITH TOY CAMERAS Oct. 9-Nov. 1. Vinson Gallery, 119 E. Court Square, Decatur. Sun.-Thurs. by appointment; Fri.-Sat. noon-9 p.m. 404-370-1720. LECTURE Lauren Greenfield, Oct. 30 at 7 p.m. Rich Auditorium, Woodruff Arts Center. Suggested donation: $5 general public / $2 students with ID and seniors. Atlanta Celebrates Photography runs through Nov. 8 at various locations throughout the city. For exhibitions dates and locations, go to www.acpinfo.org. Like many artists, Ruth Franklin uses other art to jump-start her own. For the paintings and charcoals in her lovely exhibition at Shawn Vinson Gallery (including the works above), she started with family snapshots, old master paintings and, most frequently and potently, the photos of Diane Arbus. The late Arbus earned fame with discomfiting black-and-white photographs of people, often those marginalized in society. 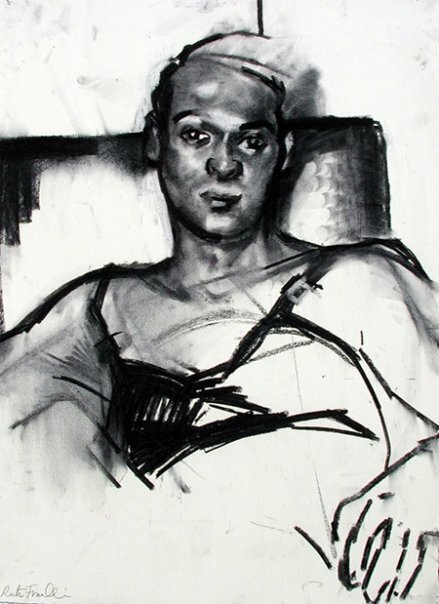 Franklin feels an empathy for Arbus' subjects, which comes out in her wonderful charcoal drawings -- a mix of careful description and elliptical line that emanates dignity. But when she makes a painting, she becomes more involved in the process of painting than in the subject. She introduces color, applied in broad, brushy strokes that render faces (critical to the Arbus effect) indistinct. Sometimes, she turns the photo upside down. It's hard to know whether familiarity with the Arbus oeuvre affects how one reads these paintings. It seems that some of the individual subjects' oddness remains, especially in the awkward gestures of the mental institution patients. The tension between the tone and the juicy paint makes for interesting viewing. Through Nov. 29. 119 E. Court Square, Decatur. 404-370-1720.